So DD’s 1st birthday sprung up and caught me by surprise! I was so engrossed in finishing her Frankenbook that I totally forgot that we’d invited our families over for tea (on the day that meant 11 adults, 5 year old DS and 2 12 month olds altogether), and they might expect cake. Doh! 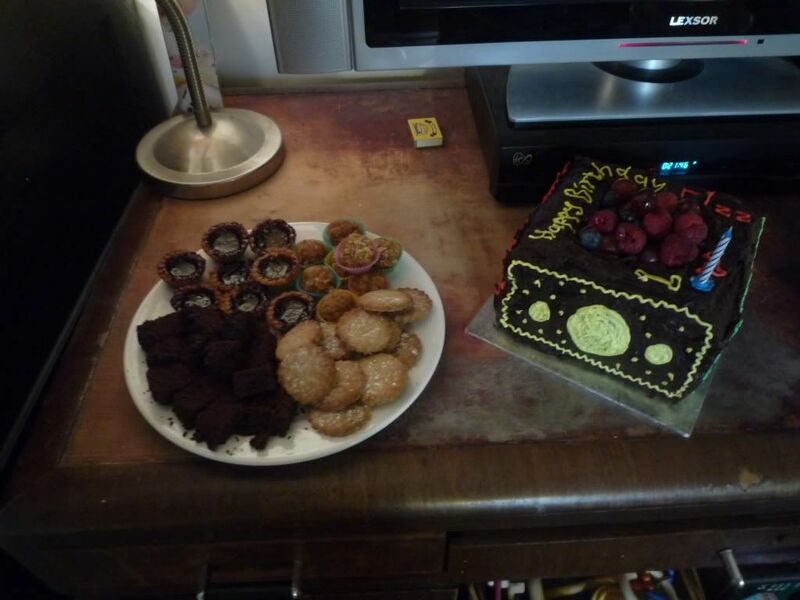 So on the morning of her birthday I got baking, and by 2pm when everyone started arriving, despite numerous mistakes and mini-disasters, I’d nearly finished (with a little help from my sisters). Phew! 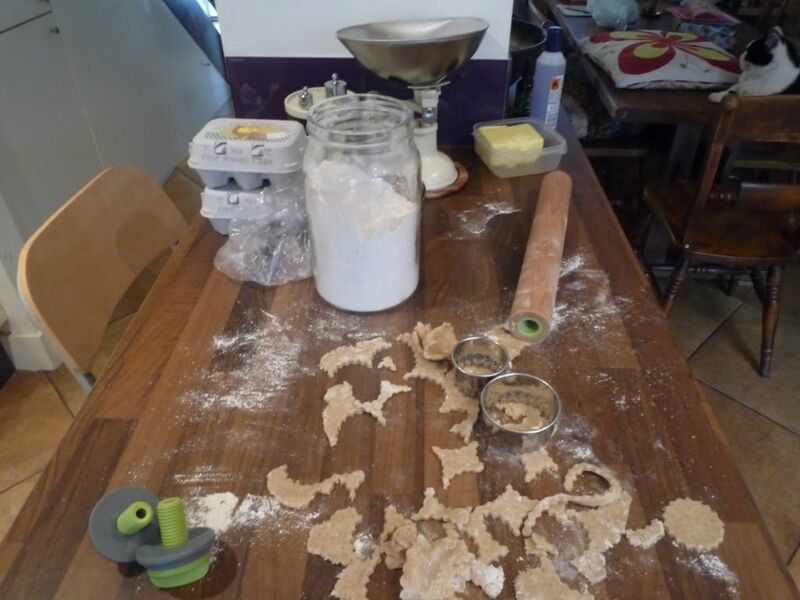 So this is basically a frantic morning in the life of a chronic last minute bodger….. 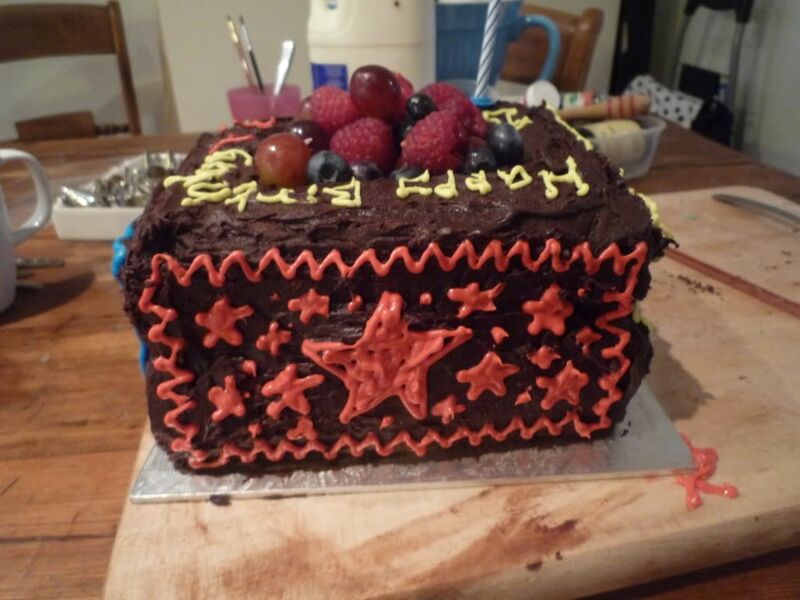 Shape Sorter Box birthday cake (with two flavours of cake) covered with Chocolate Fudge Icing and filled with berries. Sweet treats Plate with: Jam Tarts made with my mum’s home-made plum jam, Treacle Tart Bon Bons, Sweet Pastry Biscuits and Bite-Size Gooey Chocolate Cake. 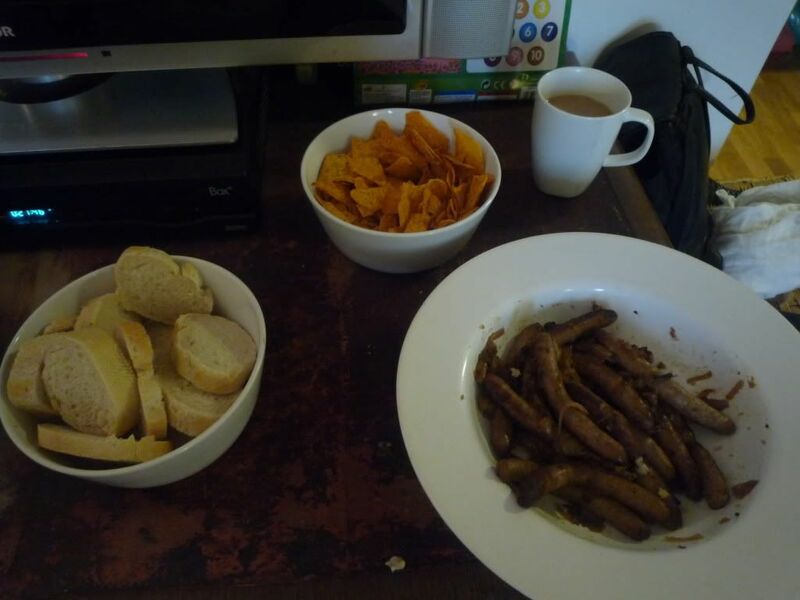 Savoury nibbles provided by DH at the last minute: sausages with caramelised onion and bread + tortilla chips. Firstly, I used what I had lying around. 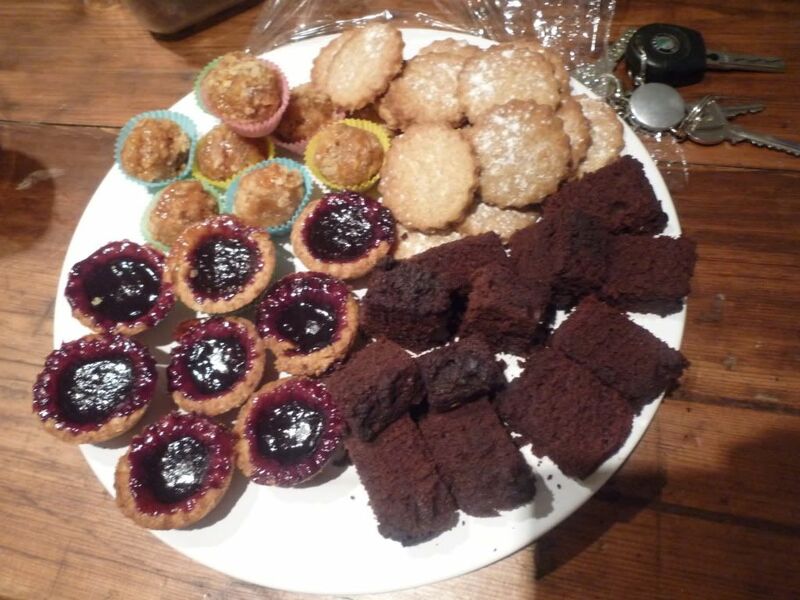 Last week DS had an ‘international day’ and our contribution of food from the UK was home made mince-pies (remember all the mincemeat I had left over from xmas? – It comes in useful!). I only ended up making a dozen mini pies for the event so I had 3/4 of a batch of sweet cream cheese and sweet wholemeal pastry left over from that in the fridge. I’d run out of oranges when I made the pastry so I’d put orange zest in the cream cheese instead. 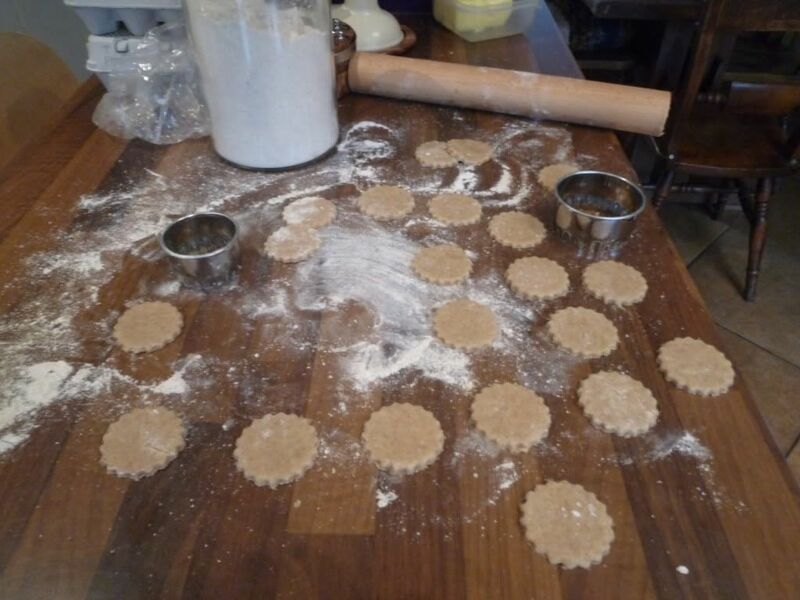 Recipes for both the pastry and the sweet cream cheese are at the bottom of my Mince Pie page: Mince Pies So a lot of what’s here are various ways to use up bakey left-overs! 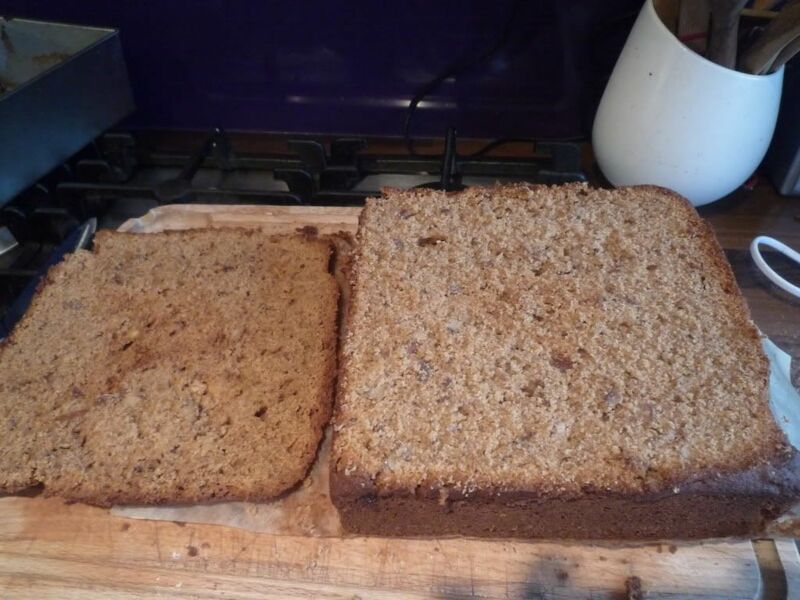 I made twice the recipe (but with only 2 bananas because someone had eaten some for breakfast! Grrrr!) 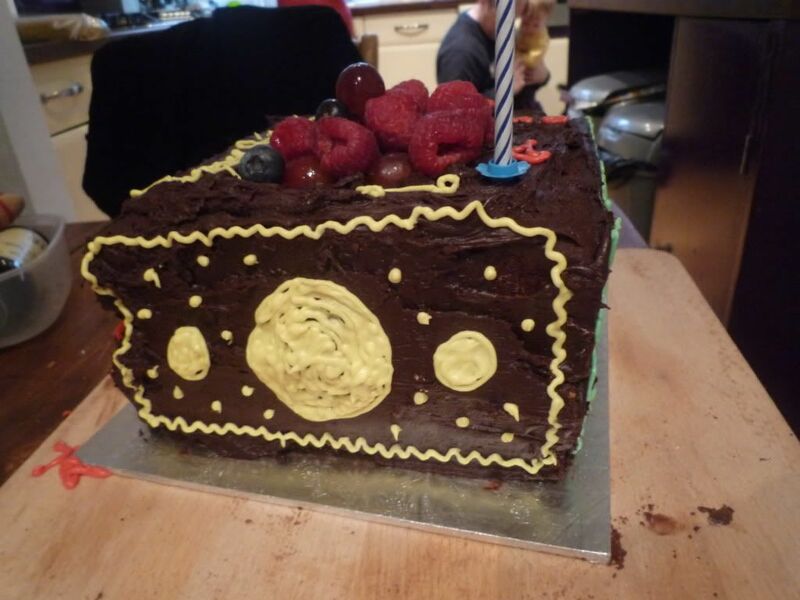 and put it all in an 8″ square cake tin. It took about 45 minutes to bake. 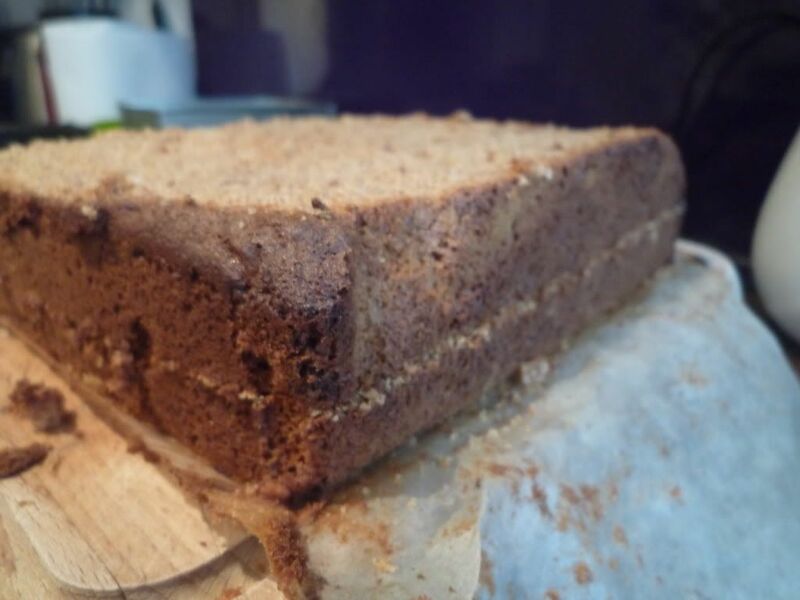 When it was cool-ish used a big sharp bread knife to slice the top off to level it (this’ll make it easier to put the top level cake on safely later). 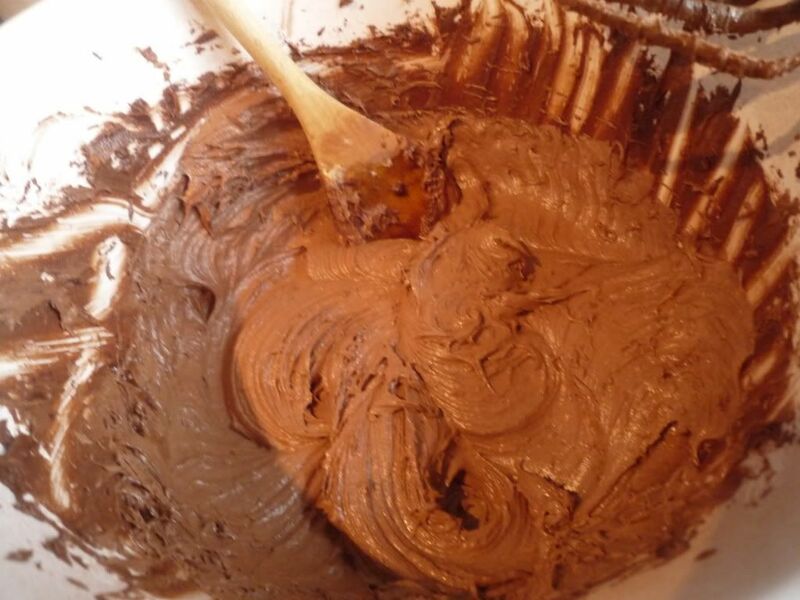 I then sliced it in half horizontally to allow for filling. 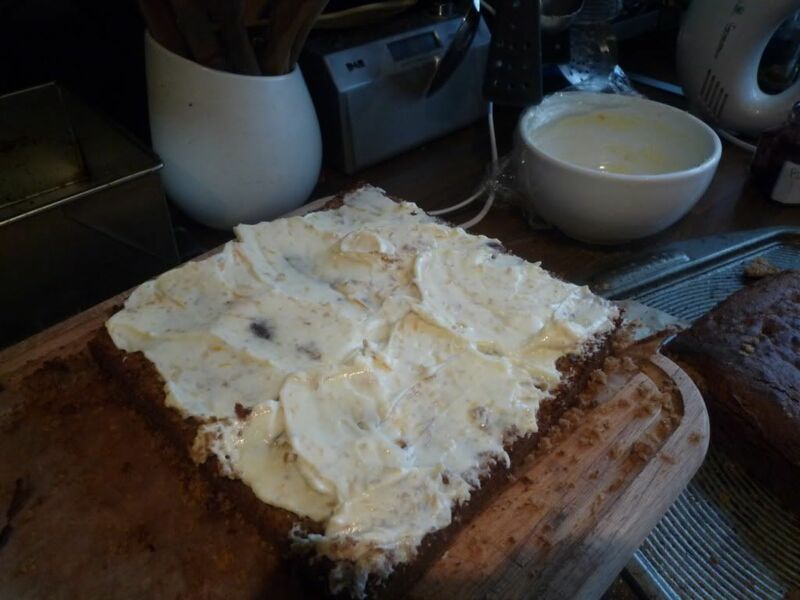 I carefully took the top half off and filled it with the orangey sweet cream cheese mixture. 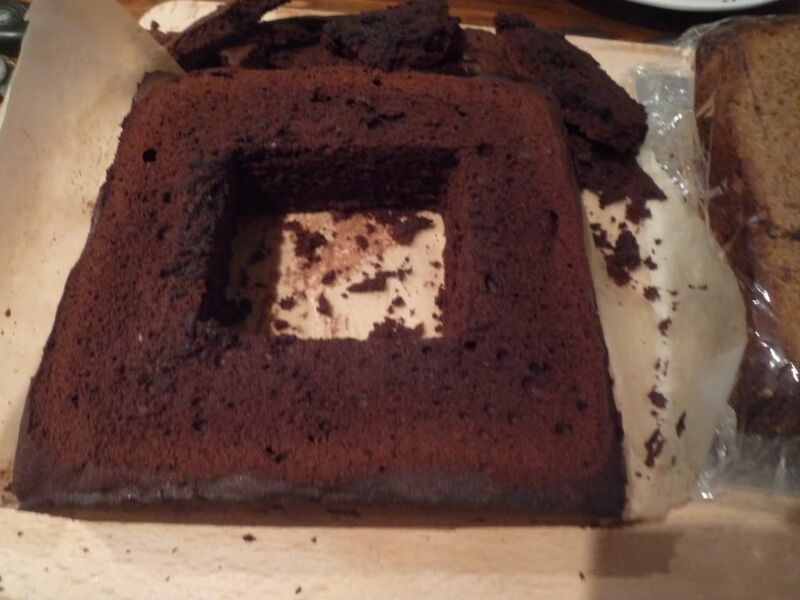 I then “carefully” put the top half of the cake back on. 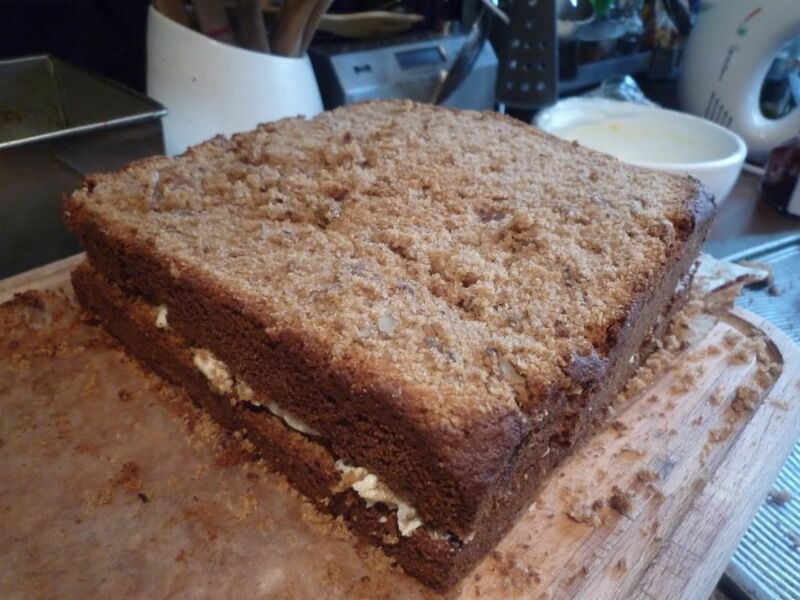 In the process of doing this, the top half of the cake fell apart a bit (it was slightly too crumbly – could have done with the gooey moisture from the 2 missing bananas and maybe 5 mins less in the oven methinks). I just put the bits back together on top of the cream cheese like a jigsaw and filled any gaps with cakey crumbs. No one will ever know! I put it on a silver cake board, covered it with cling film and put it to one side. 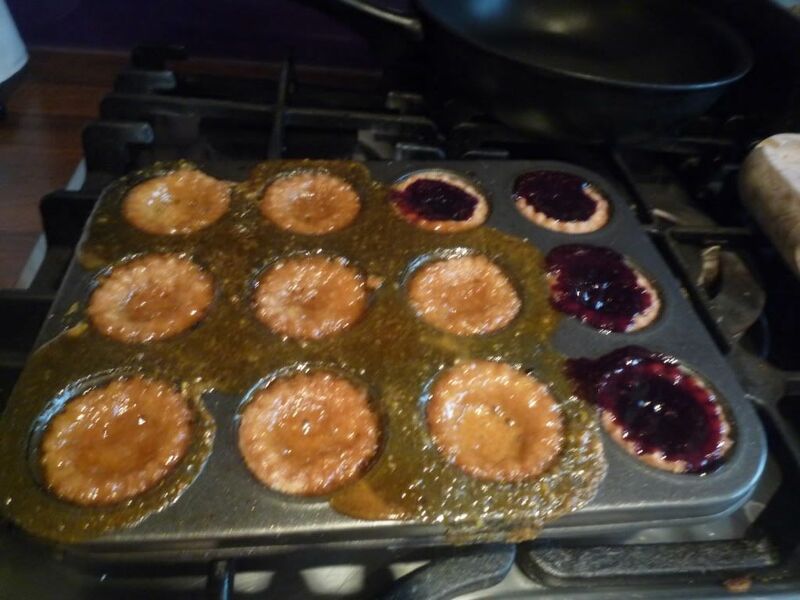 So to make use of the left-over pastry I decided to make jam and treacle tarts. 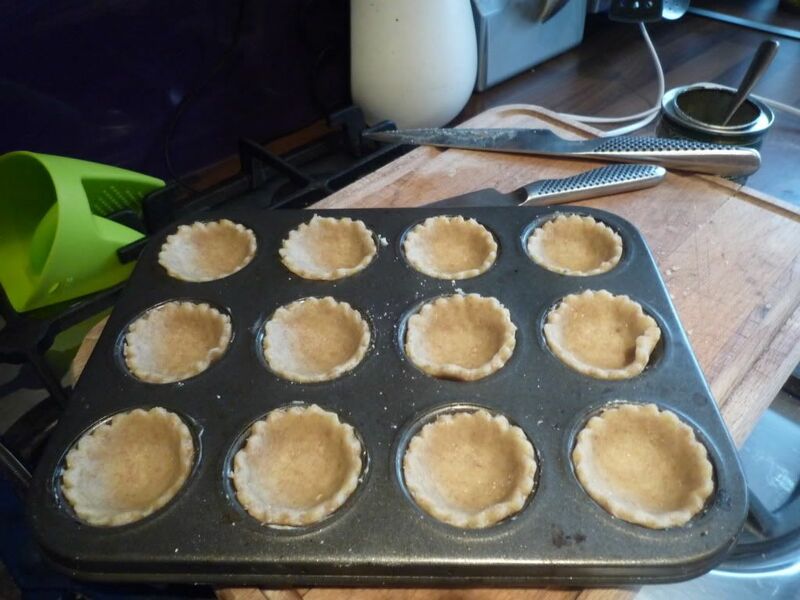 To start the tarts I simply rolled out the pastry, cut circles and put them into a buttered mini pie tray. For jam tarts I 2/3 filled them with some of my mum’s home-made plum jam. Yum! 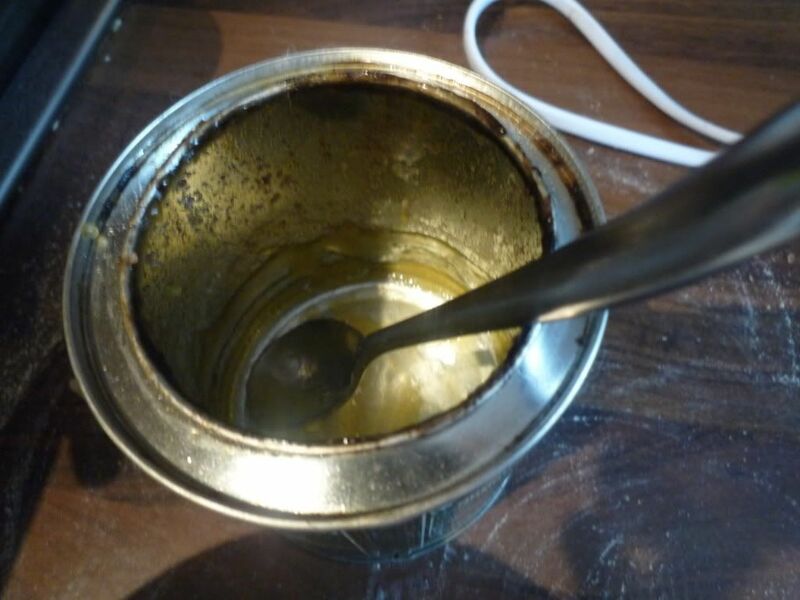 To make the treacle tarts, I first dug out an ancient tin of golden syrup. 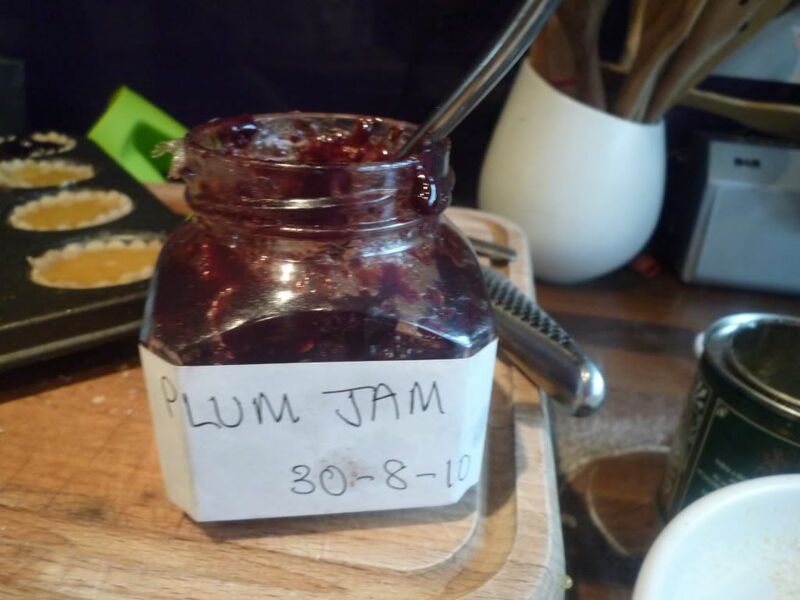 This had been left on a kitchen shelf very close to the hob and over time the heat had caramelised it. I’d kept it to use in baking as it was solid and wouldn’t pour. 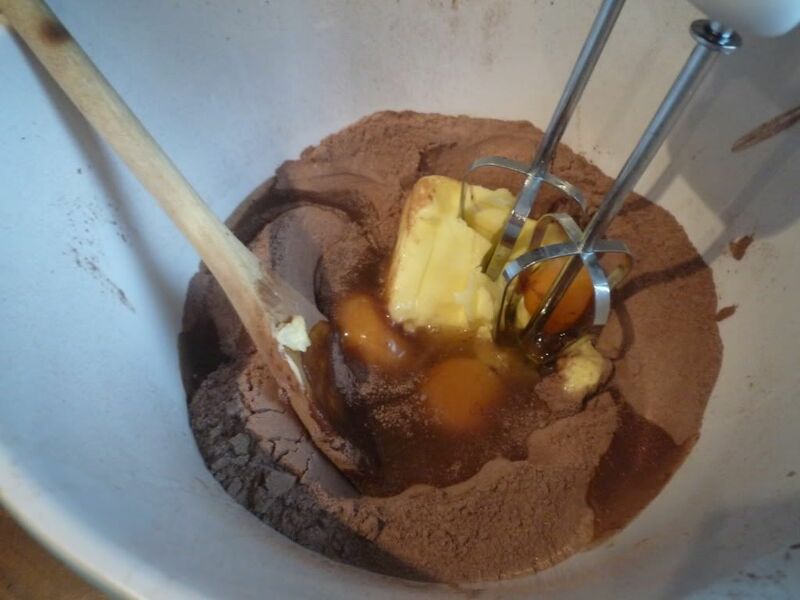 I had less than 1/4 tin so I added about a tablespoon of wholemeal flour and a teaspoon or so of fresh orange zest to the tin and mixed it all up. I used this to fill some more pastry pie cases in the tin. 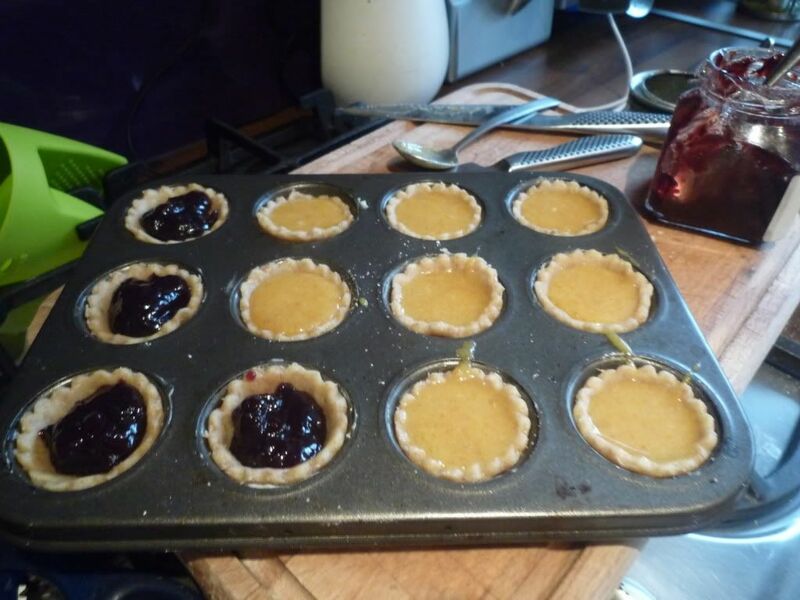 I managed to get 8 tarts out of the treacle, so made 8 jam tarts to go with them. I did this all while the banana cake was baking so as soon as the cake was out of the oven, in went the first batch of treacle and jam tarts. I’m guessing they’ll take about as long as the mince pies do, say 12 minutes…. ….12 minutes later and this is what had happened! Um…oh dear! 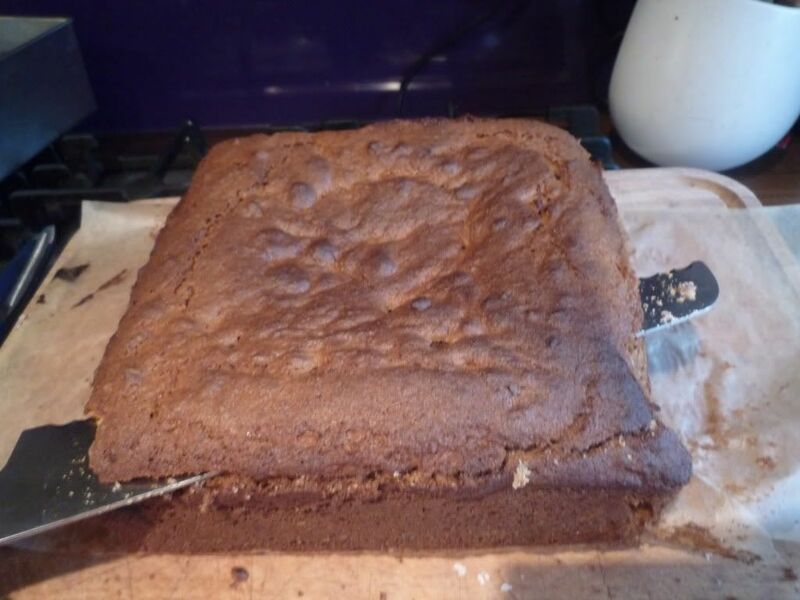 The treacle all bubbled over and congealed the pastry to the tin! 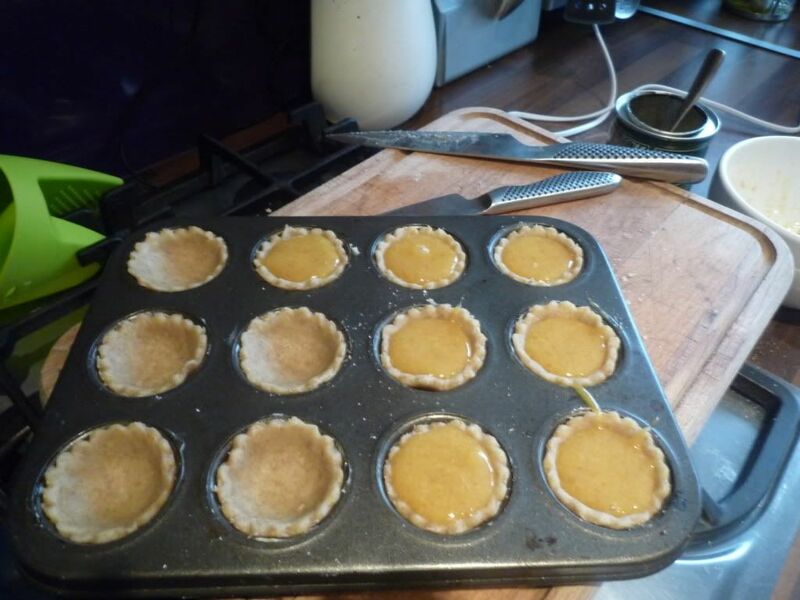 Luckily the jam tarts came out of the tin without too much difficulty, once I’d run a knife around the edge to free the boiled jam around the edges. 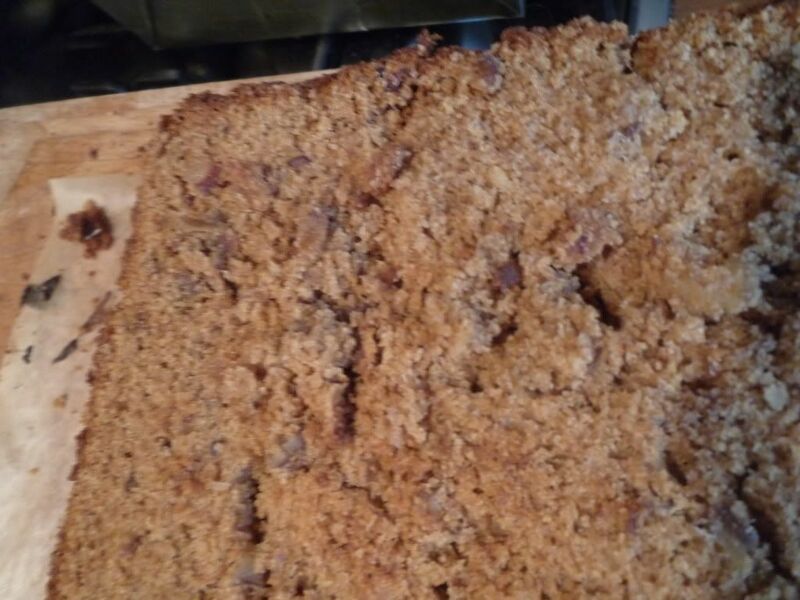 The treacle tarts were a bit more of a problem – the first one I tried to get out disintegrated into a gooey toffee-pastry mush, but it smelt amazing. 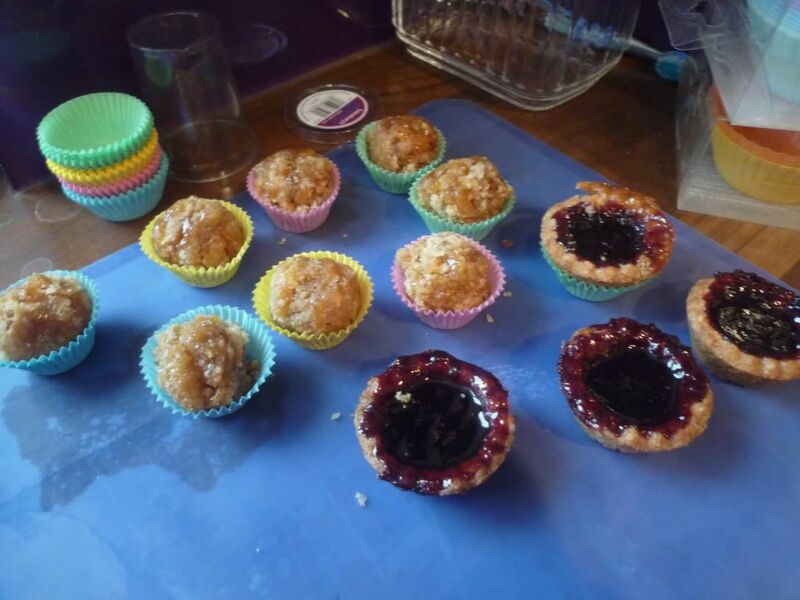 So I grabbed some mini paper cake cases from my trusty baking drawer, rolled the disasterous tart mush into a ball between my hands and popped it in. Yay! 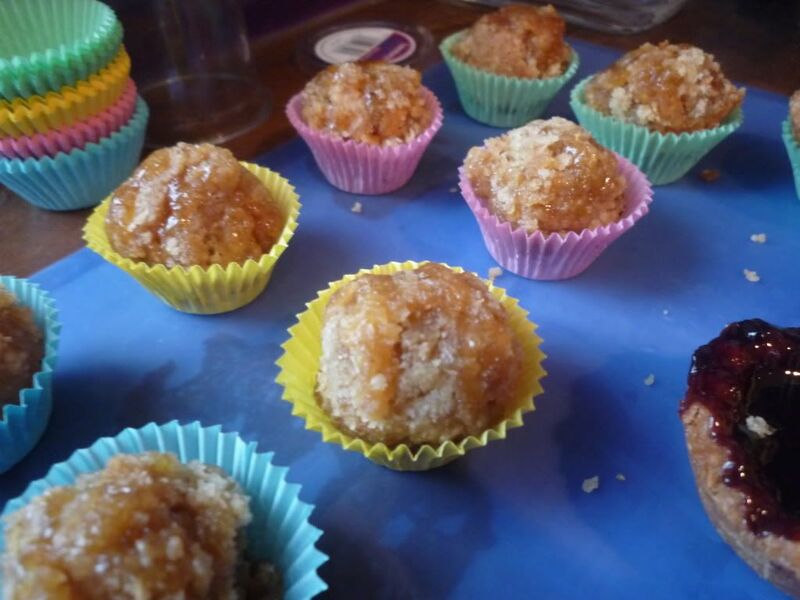 Treacle Tart Bon Bons – completely and deliberately my own new original idea (or that’s what I’ll let everyone believe!) 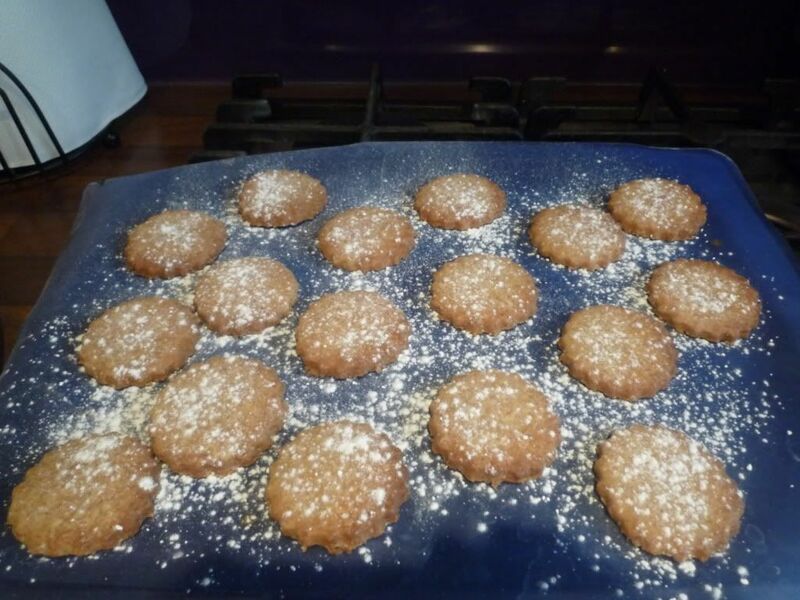 I was going to sprinkle with icing sugar, but forgot and they didn’t need it anyway – they were yummy! While the first batch of tarts were cooking, I was cutting all the rest of the pastry into circles in preparation for the next load. I think I got at least 20-30 more circles out of the pastry I had left. 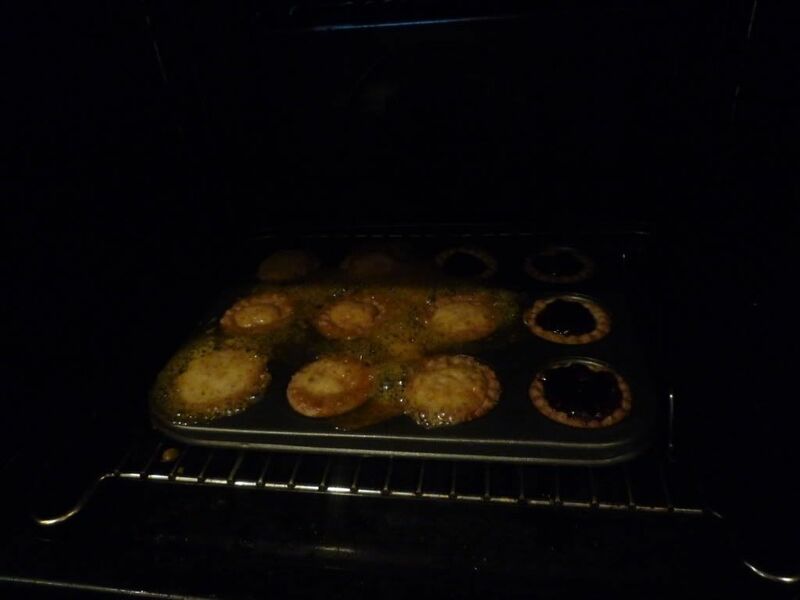 I made 4 more jam tarts, and the rest of the pastry circles will be baked on a baking tray into little biscuits. 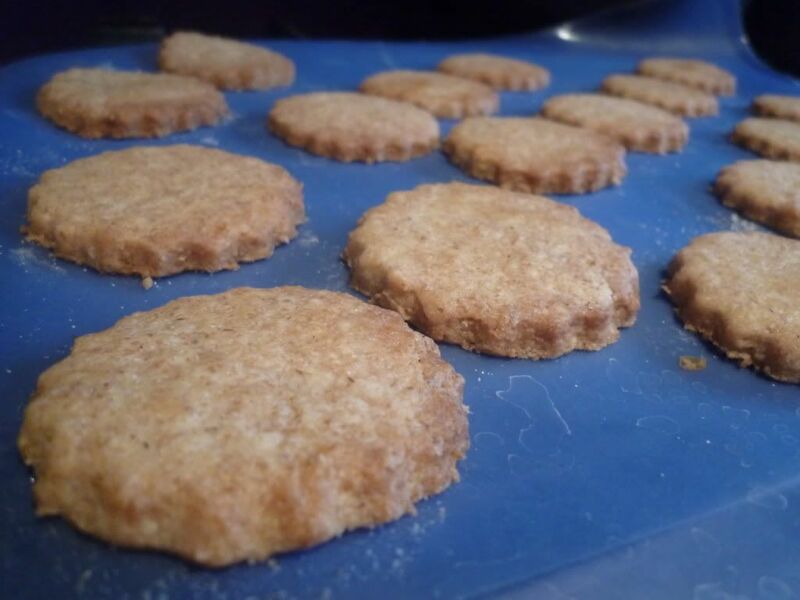 All I did was stick them in the oven for about 10-12 minutes until going golden brown, take them out again and sprinkle them with icing sugar (I use a sugar/flour shaker). Done! I made one batch of the cake mixture while the pastry biscuits were baking, beat the mixture to within an inch of its life to vent my general angst (plus the more you beat the mixture, the better the cake) and then baked it in the same 8″ tin I’d used for the banana cake (so they’ll be the same size). 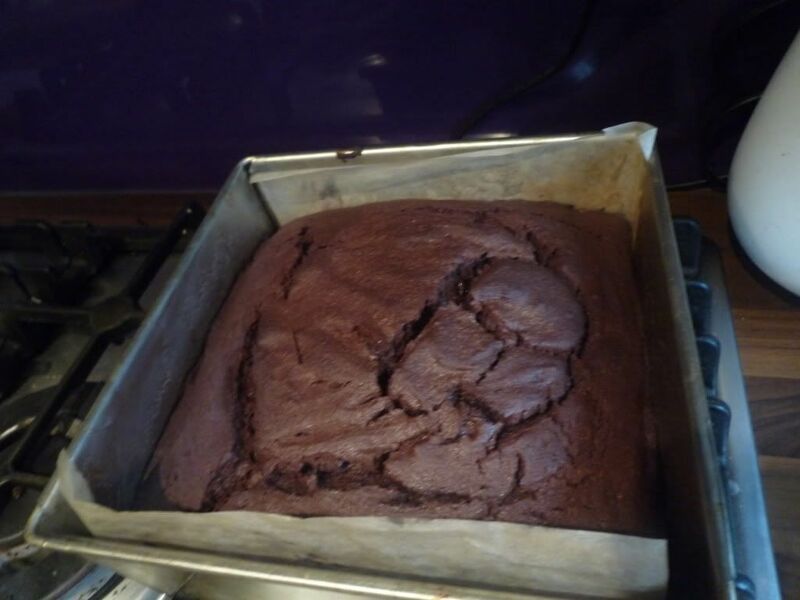 This time I got the cooking time bang on perfect and a beautiful steamy rich moist chocolate cake was the result. At last things are going right! 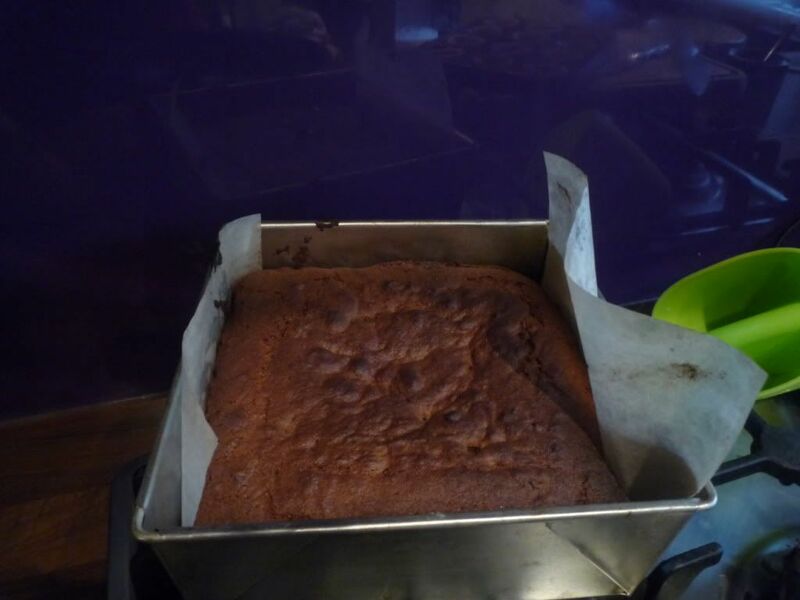 We then spread chocolate fudge icing on top of the banana cake, and stuck the hollow square chocolate cake on top. 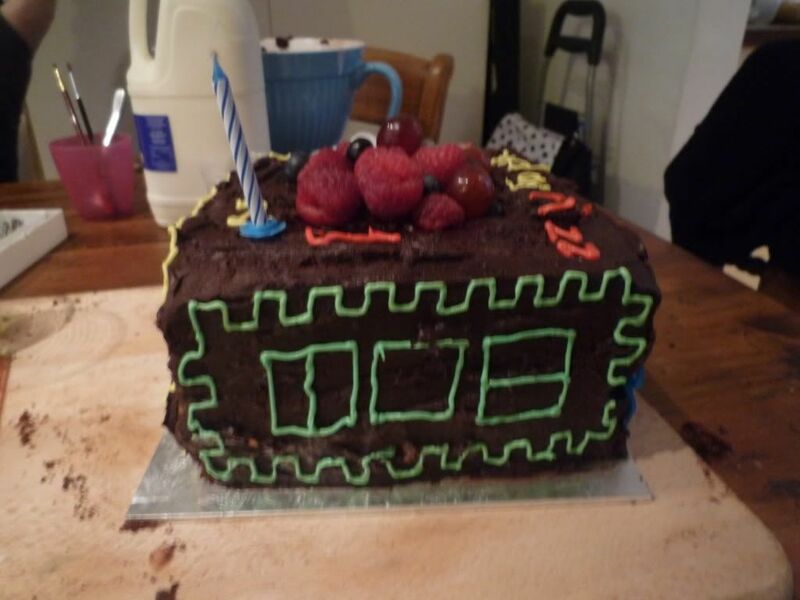 We covered the whole thing with the rest of the chocolate icing and filled the middle hole with raspberries, grapes and blueberries (DD’s favourites!). By now it was getting very close to party time so no time for pics as I went. We mixed up yellow, red, blue and green icing using egg white and icing sugar (make sure it’s stiff enough so it doesn’t run down the cake after piping). Using a piping bag and a piping syringe (luckily I have one of each! ), two of us piped the coloured icing onto the cake to decorate it, working on opposite sides of the at the same time. 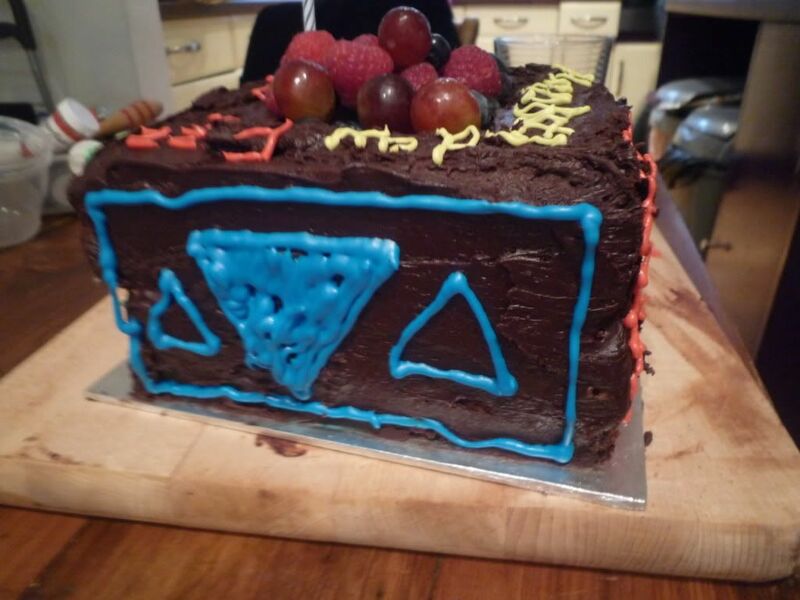 Each of the 4 sides of the cake is themed in a different single colour and a shape (either square, circle, triangle or star) – we just made it up as we went! 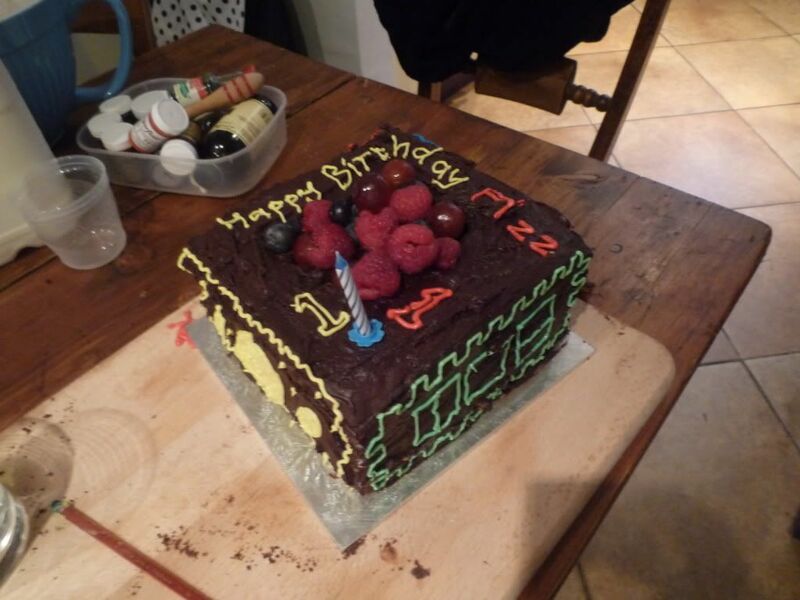 It’s very slap-dash and rushed, but when it comes to cakes I’m a great believer that what people most appreciate and are impressed by is the general effect and the overall effort involved in bothering to bake your own cake and decorate it. 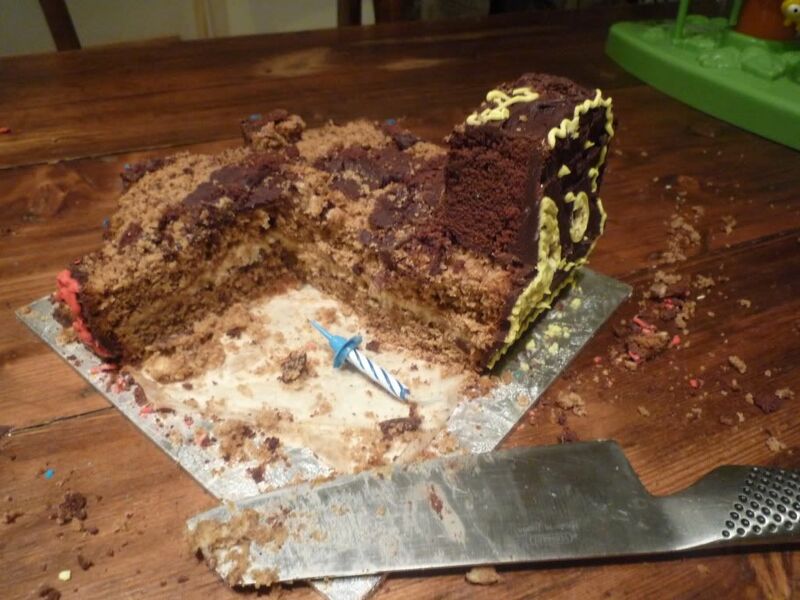 The cake tasting good also helps people to overlook most mistakes that you might think are horrific. People really don’t notice all the imperfections that you can see clearly – they really really don’t (or at least they will be too delighted and polite and cake-filled to mention them)! Lastly we added a birthday message and a candle on the top around the edge. Finished! While we were doing the cake decoration, DH had cooked up a load of sausages and onions, and sliced some bread so we had savoury treats too. Yum! 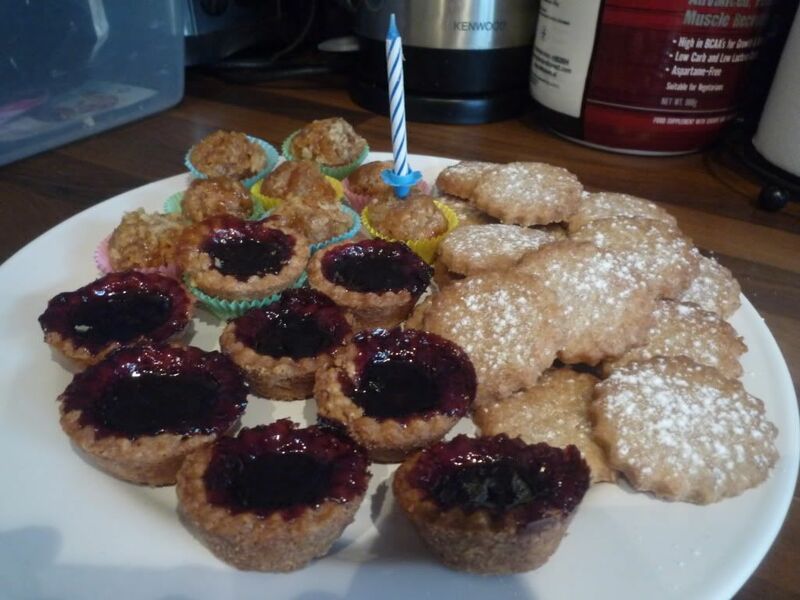 This entry was posted in Kitchen, Sweet Things and tagged 1st Birthday, banana cake, Birthday Cake, chocolate cake, Chocolate Fudge Icing, Jam Tarts, Shape Sorter Cake, Sweet Orange Cream Cheese Filling, Sweet Pastry Biscuits, Treacle Tart Bon Bons, Treacle Tarts, wholemeal pastry. Bookmark the permalink.